Buried under the shifting sands of the Egyptian desert since its abandonment in about the sixth century AD, the ancient Red Sea port town Berenike lay undetected until Giovanni Belzoni discovered it in 1818. Unable to conduct large-scale excavations or simply uninterested in what the rest of the sand-covered town had to offer, he and later visitors only investigated Berenike's temple and the surface of the site,. The current excavations at Berenike seek to remedy this neglect of the town so that more meaningful information about the people and the functioning of this important trading town may be discovered. Many things are already known about the site from the writings of ancient historians such as Strabo, Ptolemy the geographer, and Pliny as well as from texts such as the Periplus Maris Erythraei (a merchant's guidebook to the Red Sea, Persian Gulf, and Indian Ocean). Berenike was founded by Ptolemy II Philadelphus in the mid-third century BC as a place of commerce with Africa and Arabia and as a port for receiving elephants from Africa that were to be trained and used in war against the Indian elephants in the Seleucid army. These forest elephants, which were a smaller variety than the Indian elephants or the African bush elephants, were captured near Adulis, shipped up the Red Sea to Berenike, transported across the Eastern Desert to Apollonopolis (Edfu). and then brought up the Nile. Ptolemy IV Philopater obtained 73 elephants this way and tried them against Antiochus and his Indian elephants at Rafah; during the battle, the African elephants ran back through the ranks, killing many soldiers from Philopater's army. Despite the disappointing performance by the elephants, Philopater was still victorious. Several factors contributed to the choice of location of Berenike (see Egypt map). It was just within the domains of Egypt and it is near the point where the Nile nears the Red Sea coast. Though the distance over land would be less if a more northern location were chosen, the time saved in land travel would be lost battling the strong winds of the Northern Red Sea, a factor which contributed greatly to the establishment of Berenike further south. Finally, Berenike hosts a large, well-sheltered harbor that eased loading and unloading of ships. Philadelphus named the town after his mother, Berenike. Berenike came to Egypt after the death of her Macedonian husband Philip. She apparently used considerable charm and intellectual power to establish herself as the most influential of Ptolemy's wives, and, eventually, with the bearing of her son Philadelphus, she was elevated to the throne as Ptolemy's queen. Ptolemy II built temples, held festivals, and founded Berenike in his mother's name, putting her on a list of deified royalties next to Alexander the Great and Ptolemy I. A temple, which was the primary focus of research at the site until now, was erected in Berenike to the god Serapis. It is thought that the cult of Serapis was designed by Ptolemy I to fulfill two functions. The first was to provide a religious link between the Egyptian and Greek inhabitants of Egypt. Serapis was apparently a Hellenized form of Osirapis, a local god of Memphis who was himself an amalgamation of Osiris and the Apis bull (Osiris-Apis; hence, Osirapis). Serapis was unsuccessful in establishing this link and gained popularity only in Alexandria. Being the primary god of this great trading city gave Serapis the role of protector of sailors and travelers and thus gave him prominence at Berenike as well. Serapis did fulfill Ptolemy's other purpose as the patron god of the Ptolemaic dynasty, and, as an addition to the Hellenistic pantheon, Serapis enhanced the prestige of the Ptolemaic empire. The worship of Serapis spread throughout the Mediterranean lands, even reaching Britain, and became one of the last pagan beliefs to battle Christianity. It would be interesting to see if Berenike gave Serapis transport to India or the east coast of Africa. And interesting side note concerning Berenike involves Eratosthenes' calculation of Earth's circumference. He made the original calculation based on data between Syene and Alexandria, but then checked those results using data between Berenike and Ptolemais of the Hunts. Pliny credits the final result, which is remarkably close to the actual circumference considering the measuring accuracy of the times, to the latter towns. The last ruler of the Ptolemaic dynasty, Cleopatra is considered by some to be the greatest successor of Alexander, and she was constantly using her ingenuity to keep the Romans from controlling Egypt. She, being the only Ptolemy to become fluent in the Egyptian language (as well as many others-including the language of the Trogodytes, the indigenous people of the Red Sea coast near Berenike), was actually a "symbol of resistance to Rome and the promise of deliverance from her yoke" (Bell 63). Despite her clever use of Julius Caesar and Mark Antony, however, the Romans added Egypt to their dominions. One of the most important events for merchants and traders that is thought to have occurred during Cleopatra's time was the utilization of the monsoons of the Indian Ocean by Hippalus. Having gained the knowledge that the monsoons blew from the north-east during the winter and from the south-west during the summer, Greek and Roman navigators were able to make the round trip to India within a year's time. Despite the considerable danger, the lure of profits caught many enterprising fellows, and the trade between India and Rome (via Egypt) increased dramatically. Once the Romans had mastered the use of the monsoons, they no longer had to use the Arabs as expensive middlemen for Indian goods. After the Romans took over Egypt, they used it basically as an estate from which they extracted grain, taxes, and other forms of wealth. They put very little back into the country. However, as important as what was produced in Egypt was the access to the trade routes with India and Africa that brought in such highly valued goods as pepper and ivory. The Romans created a series of roads between the Thebaid and the ports on the Red Sea coast to facilitate trade with Africa and India and to make the natural resources of the Easter Desert more accessible (see Eastern Desert map). This primarily took the form of mines of gold and emerald, and quarries of porphyry and granite. To make movement through and around the desert possible, watering stations were set up at twenty mile intervals. These eventually became fortified posts to protect travelers from raids by the desert inhabitants. Travel along the Berenike-Coptos road (272 miles long) was done during the night because of the extreme heat, and the trip took twelve days to complete. The primary Red Sea ports were Myos Hormos, Philoteras, Leukos Limen, and Berenike. In early Roman times, Myos Hormos was the most frequented of these ports. This is perhaps because the desert roads were less secure during these times, and the trip to Myos Hormos from the Thebaid took six to seven days less than the trip to Berenike. However, Berenike eventually replaced Myos Hormos as the most prominent port because it "had one great advantage over Myos Hormos: it was some 230 nautical miles further south, and that spared homebound vessels days of beating against the northerlies [winds)] that prevail in the Red Sea above latitude 20. Merchants might have saved six to seven days in overland transport by sailing past Berenike to discharge at Myos Hormos, but they might well have lost a month in making the attempt" (Casson 97). Leukos Limen, which had been used by the Ancient Egyptians under the name Duau, came to use most probably in the late first century AD. All of these ports faded from use with the conquering of Egypt by the Arabs, though a few were retained in some capacity to transport Islamic pilgrims across the Red Sea to Mecca. A great deal about the trade between Rome and India and Africa is known from the Periplus Maris Erythraei. The author, whose identity is not known, was apparently an Egyptian-Greek merchant-trader who most likely lived at Berenike in the middle of the first century AD. In the Periplus, he describes the many aspects of the ports located on the Erythraean Sea (Red Sea, Persian Gulf, and Indian Ocean). He discusses their rulers, the local character and appearance of the people, the goods to bought and sold, and other useful bits of information. Trade with Africa, (east coast) seems to have been a safe, time consuming (two year round trip), and reasonably profitable venture that was taken up by merchants who had little capital. Trade with India, however, was dangerous (due to storms and pirates), quick (one year round trip), and highly profitable, making it attainable only for those who could raise the sufficient capital. Often, one ship would carry the cargoes of several merchants who each leased separate holds on the ship. A summary of some of the trade goods mentioned in the Periplus is given by Casson. From Africa: ivory, tortoise shell, frankincense, myrrh, and various grades of cassia. From Arabia: frankincense, myrrh, and aloe. From India: native spices and drugs and aromatics (costus, bdellium, lykion, nard, malabathron, pepper), gems (turquoise, lapis lazuli, onyx, diamonds, sapphires, "transparent gems"), textiles (cotton cloth and garments as well as silk products from China), ivory, pearls, and tortoise shell. (Casson 17). Some of the things exported by the Romans to the Horn of Africa include undressed cloth, robes, cloaks, flint glass, myrrhine (travertine) from Thebes, copper, sheets of soft copper, iron, wine of Italy, and olive oil. However, a trade imbalance seems to have existed between India and Rome, with India having the advantage. In AD 77, Pliny wrote that Indian rulers had been exploiting the Romans by absorbing great amounts of money and giving merchandise in return at a hundred times its prime cost. The Romans did have a few things that were highly desired by the Indians. Among these were emeralds, which Indian rulers wore set in their crowns. These emeralds were procured by the Ethiopians from the Blemmyes, with a large profit going to the Ethiopians. Indian women also fancied the red coral which is prevalent along the Red Sea and Mediterranean Sea coasts, and they would pay up to twenty times the weight in gold of the coral, which they used to make jewelry. Berenike also had a nearby source of peridot on Zabargad (St. John's) Island. When they first began trading in the Eythraean Sea, the Greeks and the Romans were mostly limited to trade within the Red Sea and the nearby African coast. Arabs supplied Indian goods at ports such as Ocelis and Muza and withheld their sailing knowledge of the Indian Ocean from the Greeks and the Romans so as to maintain their monopoly on Indian goods. Eventually, the Romans also perfected the use of the various monsoons and began bypassing these ports except as last stops to obtain supplies to get them across the Indian Ocean. Even with their knowledge and big ships, the Roman merchants had to be wary of attacks by the pirates who stalked the Erythraean Sea. Traders often carried companies of archers on their ships for protection. The author of the Periplus even advises his readers to sail down the middle of the Red Sea and avoid coming close to the shore as a way of slipping past the pirates of the Red Sea. With this brief overview of the Greek and Roman history relating to Berenike and its trade, attention can now be focused on the site itself and its surrounding areas (see Figures 1 and 2). The town's ruins were almost discovered in 1541 by Juan de Castro. He scanned the coastline near Berenike, but did not land, and thereby failed to see the ruins he was looking for. Finally, Belzoni discovered Berenike in 1818. He proceeded to excavate the temple in the scientific fashion of the day-he set a young Bedouin boy to digging with a shell while he was out exploring and drinking tea. The boy unearthed some artifacts and revealed some hieroglyphs. In the 1830's, Wilkinson visited the site and made a more complete investigation, including a map of the town and a nearly complete excavation of the temple. His drawings of the hieroglyphs in the temple remain as the only record of some of the writings on the temple, as the hieroglyphs themselves eroded away after the excavations exposed them. Wellsted also visited Berenike in the 1830's and described the town as consisting of 1000 to 1500 houses that branched off in narrow streets at right angles to each other (Wellsted was perhaps projecting his own ideal, as the modern survey shows that the layout of the town is not nearly so ordered). Wellsted gave the latitude of Berenike as 2315 N (the coordinates given by the most recent measurements are 23 54.62 N / 35 28.42 E). Other scholars and explorers, such as Golensheff and Murray, came to Berenike and conducted various excavations of the Serapis temple and surveys of the nearby desert during the 19th and 20th centuries. Apart from temple excavations, explorers at Berenike also made many surface finds. These include old nails, fish hooks, nets, old coins, emeralds, potsherds (in great quantity), glass of various colors, glass beads, pieces of agate, brass, keys, bracelets, Roman coins, knitted work, textiles in scraps, weaving, and bits of papyrus in Greek cursive hand (Meredith 58). Some of the items found during the temple excavations include a bust of Serapis with an inscription in Roman lettering, the head of a Roman statue, a bronze arm, a marble arm, half of a full stone figure, a figure holding an animal over its head, a bad figure of Isis and Horus, pieces of alabaster (actually travertine) and marble, a terra cotta lamp, wooden clamps, a fragment of alabastrine stone with a Greek inscription on each side, a tablet of reddish pudding-stone thought to be part of a stele of a hereditary prince, and a stone tablet with a groove around the edge and an incised symbol that resembles an anchor (Meredith 62-70). Some of the rulers mentioned in various inscriptions include Ptolemy VII (Euergetes II), Cleopatra, Marcus Arelius, Lucius Verus, and Tiberius. Belzoni estimated the town had about 2000 houses and a population of 10,000. Wellsted felt that neither the size of the temple nor the extent of the town would seem to fit that of an emporium between the East and the West; however, he adds that Berenike, being 270 miles from the Nile and far removed from populated areas, is about right for its purpose. Murray called it an "annual market town of 1000 booths" whose only permanent buildings were a small temple and a couple of warehouses. He felt that people occupied Berenike only during the time when ships left for and returned from India. It is known that wealthy families had agencies in Myos Hormos and Berenike to handle family interests in overseas trade. Investors in Egypt, Rome, and other great centers funded merchants through these agencies. It is quite possible, therefore, that many of the Egyptian-Greek inhabitants of Berenike worked there as businessmen when the ships were being received or sent off, before or after which they would supervise the transport of their clients' goods over the desert. They did not leave their expensive luxuries totally behind when they ventured to Berenike, as indicated on ostraca which tell of fine Italian wine shipped to Berenike for local consumption. Under their employ were probably many people from local nomadic tribes who aided the transport of goods across the desert, helped the loading and unloading of ships, and maintained Berenike while the agents were gone. Also connected to the town of Berenike are two forts and two settlements near and mountains to the west of the site. Both forts are located in Wadi Kalalat, eight kilometers to the northeast. The smaller fort simply met the needs of a normal fort, but the larger fort contained a large cistern with a diameter of 32 meters which is thought to have been the main water supply for Berenike. The settlement at Shenshef, roughly 15 kilometers south of Wadi Kalalat, consists of about 150 clean, well-built houses and a hill fort. It has salty, but drinkable water readily accessible. Almost all visitors to the site have been particularly impressed-the surveyors of the current expedition lauded the quality of construction and layout of the houses. Murray felt that Shenshef was well-protected to store precious goods from Berenike, and that it would have been a good place to reside between September and January for officials and merchants needing to write reports and make up accounts. 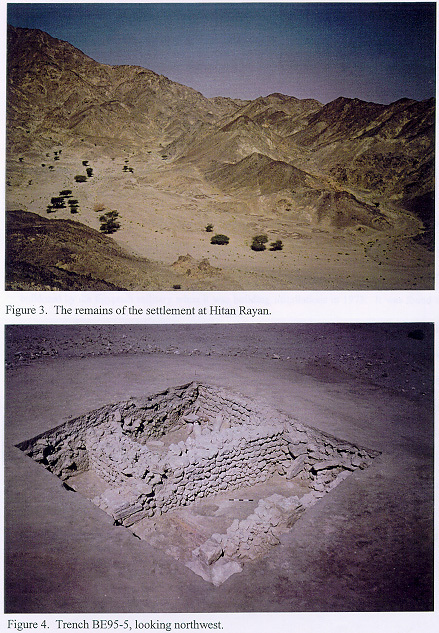 Perhaps a bit more enigmatic is the settlement at Hitan Rayan, which I had the chance to visit (see Figure 3). The structural remains are stone walls about two feet high that define the outlines of the various buildings. These buildings would have probably been completed by erecting tent structures on the tops of the walls. Several burial cairns and graves are located on and near the site. The function of Hitan Rayan is not known, though I heard one opinion that it might have been a local copy of the Shenshef site. Both forts and both settlements have been linked to Berenike through pottery evidence. Having described some of the history and features of the site, I will now discuss the current excavations and their results. The project is a joint US-Dutch effort and is co-directed by Dr. Steven Sidebotham of the University of Delaware and by Ms. Willeke Wendrich of Leiden University. The team consists of a mixture of US, Dutch, English, and Belgian scientists, professionals, and students. Ababda Bedouins were hired to help with digging, sieving, moving, washing, and other odd jobs and as guides to the surrounding areas. "The general research question for the project is to determine how the settlement Berenike functioned in the international trade contacts, by multi-disciplinary research into the way of life of the population, the structure of the settlement and the character of the long distance trade" (Wendrich, letter to expedition participants). The current excavations are in their second year, and it is quite possible that they could extend up to 15 more years because of the vast quantities of information that remain below the sand that covers the town. The 1994 excavations were conducted to ascertain the productivity of the site and the nature of the finds and to conduct surveys, in addition to trying to answer the general research question stated above. Two trenches were worked, the first one located at one of the highest points on the site and the other located close to the harbor. Trench BE94-1 was dug on an area that had been bulldozed by the Egyptian military when it was building installations in 1973. It was found that while the bulldozing did turn up a lot, as indicated by the increased quantity of surface finds, it has had little impact except for the topmost portions of the site. Trench BE94-2 was dug in a section of a building that appears to be a warehouse-the primary hope being that it would reveal a definitive connection with India. Some items did indicate such a link, these being a coconut, an Indian resist-dyed textile, and numerous beads. Other finds included pottery, metal fragments, glass objects, a writing tablet, coins (60 total, dating from Ptolemaic times to the 4th / 5th centuries AD), nails, bands of copper alloys, iron remains, and Nile Valley and Nubian basketry. A survey was done of the site to produce an accurate map of all visible remains (see map, next page). To do so, a fifty meter square grid was laid out using a point triangulated from the temple as its first reference point; from this grid, all relevant points or items of interest could be mapped. The mapping showed the town remains to cover approximately seven hectares, with the greatest linear dimensions being 320 meters east to west and 250 meters north to south. In addition to establishing some minor connections to India, the 1994 season also found that Berenike, Shenshef, and Hitan Rayan were all linked through pottery. It also seems possible that Berenike had local metal, rope, and glass production. The small amount of fish remains indicates a population originating primarily from the desert rather than the Nile or the Red Sea, though the local population seems to have been a mixture of Nubian, Egyptian, and nomadic peoples. The 1994 Berenike report also characterizes the materials used to construct the buildings as low in quality, indicating the minimization of costs by government officials and private entrepreneurs who needed only temporary housing and storage facilities. It is probable, however, that early phase building materials were better, using primarily anhydrite and gypsum stones rather than coral rocks as in later times. 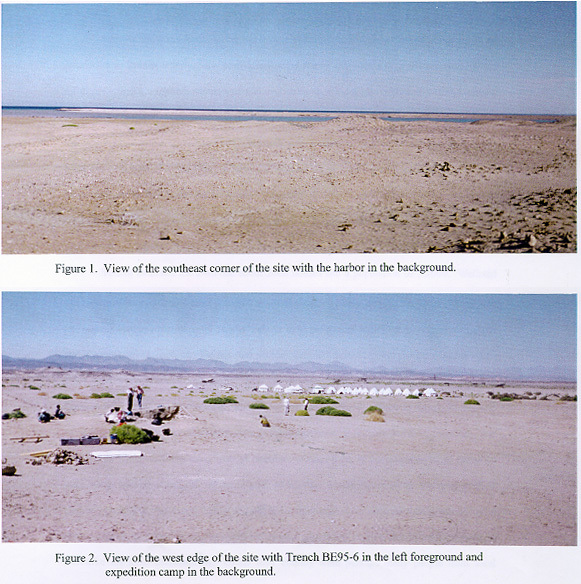 The survey also identified a 25 meter by 300 meter earthwork bank (on the northwestern shore of the harbor) that was possibly the product of dredging to remove sand, which had been brought in by the wadi, from the harbor. The 1995 excavation and study seasons were much more expansive than the previous year's exploratory investigations. Trenches one and two were continued and were to be ultimately joined by five more. More specialists, in fact, more people in general, were at the site to contribute what they could. maps were made of Shenshef and Hitan Rayan and plans were drawn of the Kalalat forts. The purposes of trenches one and two have already been elaborated. Trench one had many trash deposits from the 5th/6th centuries AD, and it had minimal architecture. Dr. James Harrell, the site geologist, and I cored a 2.9 meter hole in this trench and found pottery sherds all the way down. It was decided to discontinue trench one (at least for now) because it would become too deep and awkward (at 5 meters plus) before reaching the lowest level and because it lacked substantial architecture. Trench two did reach bottom this year, ultimately showing three major architectural stages. A wall that showed on the very edge of the east balk of trench two may be part of a building that was partially washed away in the wadi, so another trench may be added next year to determine if the town extended past the mound that presently marks the edge of the site. Trench BE95-3 was dug on the west end of the site to see what was happening there, but when no architecture showed up (though a lot of trash deposits did), the trench was discontinued. Trench BE95-6 was then begun nearby, with some fascinating results. 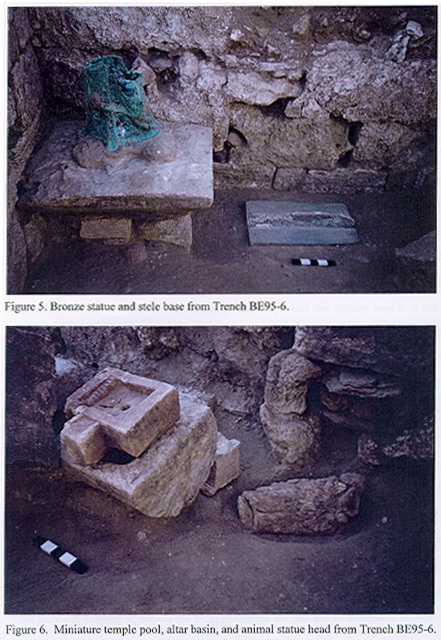 Some items found there include a bronze statue, a carved animal head, two altar basins, a stele base, and an incense burner, indicating that trench six had unearthed part of a place of worship, if not a temple. The walls were constructed of anhydrite and gypsum blocks, a much higher quality building material than the coral that predominate most of the trenches. Trench BE95-4 was placed in one of the largest visible buildings on the site. From what could be seen, the building consisted of an inner building surrounded by an outer wall, almost like a sanctuary. Shortly after the season began, Trench BE95-7 was placed in the north end of the building on the hunch that it might be a temple. However, the finds from both trench do not indicate that the building was a temple. More likely, due to the amphoras, many coins, and other things found there, it was a place of commerce, or perhaps even a customs building. Trench BE95-5 was placed on the southernmost portion of the site near the harbor and, in fact, is the south-easternmost trench ever excavated on a Roman site. Not only did it exhibit some very nice architecture (see Figure 4), it also unearthed ten complete and nearly complete amphoras-some of which still had fish sauce powder in them. It is not clear what the function of the building was, but it seems quite likely, because of the amphoras and its proximity to the harbor, that the building served as a shipping office for a family or a company. During the last few days of the study season, I talked with many of the specialists individually and took notes on their observations. A list of the specialists and trench supervisors is included at the end of this report. I must apologize for the simplistic descriptions given for the specialist areas and the trenches, but in depth discussions of these topics are beyond the scope of this report. Textiles. Over 400 textiles have been found at Berenike, primarily in the 4th and 5th century trash deposits. The preservation is poor, but a full range of materials, including cotton, flax, wool, and hair has been found in the textiles. Berenike appears to have been a consumer city, obtaining most of its textiles elsewhere and often getting the best. Some cottons from Nubia were found, as well as a resist-dyed textile with a flower pattern. This probably came from the Nile Valley, and it suggests that it was used in a nice house. Bits of tapestries were also found that indicate that residents of Berenike were trying to make their homes somewhat elegant despite the poor quality of their construction. A rather fascinating piece was a weft-faced compound tabby with a complex weave that could allow a weaver to pull colors or hide them at will. Pigments and dyes. The dyes found in the textiles at Berenike were rather expensive ones. One found was murex, which is a dark blue that comes from murex shells and is very difficult to obtain-only very wealthy people could have afforded it. Another dye is kermes, a red which comes from an insect. A bright orange powder found caked inside a piece of pottery seems to be a mixture of lead oxide and lead carbonate. Another powder, which is bright blue with some fine quartz particles mixed in, was identified as cuprorivate, also known as Egyptian blue. These were identified by using powder x-ray diffraction. Metals. Many metal artifacts were found in the 1995 season. The major one was a bronze statue, but also found were copper forks and spoons, copper and iron nails, two bronze keys, a small bronze bell, belt buckles, rings, needles, and clips. Also, a simple 20 centimeter iron knife from the 1st-3rd century iron industry was found. Some iron products were made locally as there would have been no need to bring in big machinery to work iron. Iron slag can still be seen on some of the hills just outside the main town. Coins. One-hundred and twenty coins were found, one-fourth of which were identifiable. Three bronze Ptolemaic coins were found, two of which were from the time of Ptolemy II (c. 275 BC) and another which depicted Zeus. Next were two of Augustus, followed by 1st century bronze coins of Augustus, Tiberius, Claudius, and Nero (which is part silver). One tetra drachm and one bronze of Vespasian follow, after which a gap occurs until three of Philip I (c. 250 AD). All of the three previous coins were minted in Alexandria. Some late 4th century Roman coins include one of Theodosius I (which had the Christian C-R symbol on it) and one of Arcadius which was minted in Aqiliea. Some of the coins show their mixed Roman and Egyptian parentage on opposite sides as with one of Tiberius with a hippopotamus on the reverse, a Vespasian with Isis, and a Nero with a snake. One of the coins of Claudius is possibly a local copy. The latest coin found was a Theodisius II from the 5th century. Pottery. The excavations turned up basically what was expected-namely, a lot of amphoras, which constituted ninety percent of the pottery. Everything was imported, but many were Egyptian copies of outer wares. The material at Berenike is similar to the ceramics of northern Red Sea locations such as Suez, Abu Sha'ar, and Mons Claudianus, but there is no Indian connection yet. Various types of "native" wares were present, including those of Nubians, Blemmyes, and nomads and some decorated red blackware. Also found were terra sigilata fine wares, some of which were made in Italy, but most of which were Egyptian copies. The amphoras were mostly from the Nile. Some of their contents would have included fish sauce, wine, oil, and flour. The pottery dates from the 1st century BC to the 5th/6th centuries AD, with the majority occurring after the 1st century AD. Glass. Surprisingly, some very good, very delicate fine wares were found at Berenike that had more special shapes than normal Roman usage. Two of these were drinking glasses and one was a perfumed oil bottle. Glass and shell beads were apparently produced in Berenike, as indicated by a shell with unfinished beads being carved out of it and by a glass waster from bead blowing. Some real usage wares were found, but they were mostly in fragmentary pieces. Wood. Very few wood items were found, primarily because wood does not preserve well in Berenike's moist soil. Some of the items found include a comb, a spindle whorl, some turning pieces or caps, and other basic things. Some of these were made of acacia, a hardwood from the Nile. Archaeozoology. All of the animals at Berenike were for either work or consumption-pets were a luxury not afforded. Camels, donkeys, and horses were there for work. Sheep and goats, which can survive quite well on the desert fauna, were generally slaughtered young. Large cattle were probably brought from the Nile, and pigs were possibly imported. Some wild animals such as hares, foxes, sea cows, and gazelles were hunted for their meat and their hides. Over thirty species of fish were present. The powdered remains of a fish sauce were found in the intact amphoras from trench five. This was made by putting salt on the fatty parts of fish and leaving it to ferment in the sand. Such sauces are still consumed today. Archaeobotany. The focus this year was on cultivated species, twenty-three of which were identified. These can be used to find out not only about what people were eating, but also about the trade routes which existed. There were five different regions of origin, one of which was the Mediterranean basin (Italy, Greece, etc.) from which walnuts, hazelnuts, peaches, almonds, and olives were brought. Flax, legumes (lentils, white lupines, and bitter vetches), barley, wheat, watermelon, grapevine, and coriander came from the Nile Valley, and sugar dates, dates, doam palm, and Christ's thorne came from the Eastern Desert. Sorghum was brought from Sudan, and rice, pepper, Job's tear, and coconuts were imported from South Asia. Sorghum could have been locally cultivated in periods of high rain, as well as wheat and barley. Barley would have probably been for consumption by animals, as indicated by its presence in dung. A lot of animal dung was found, but none had been burnt as fuel. Geology. Berenike was built on top of a coral terrace which is surrounded on the north and west by Wadi Mandi and on the south and east by a supratidal flat (sabkha). The tectonic uplift that raised the coral terrace to its present elevation of about two meters above sea level must have occurred before Berenike was founded; otherwise, it would have been built near sea level, which is highly unlikely. The sea level has risen at least one meter since the town's beginning, placing its lowest walls at current sea level. The harbor was very different in appearance and extent in Roman times, as indicated by the sabkha stratigraphy revealed by coring. Cross-sections of the sediment along a given row of coring holes display three main facies of the sabkha. The uppermost facies was formed by wadi and wind deposition, the middle by sedimentation on the beach as it was continually pushed back by wadi sedimentation, and the bottom by the deposition of sand and organic material under water (of the lagoon). These results indicate that the lagoon may have at one time reached the edge of the town and that it is still receding. Certain patterns of sedimentation and the presence of sherds as deep as 1.25 meters in the embayment north of trenches four and seven indicate that the area could have been a secondary harbor that was connected to the bay via a channel, but more coring needs to be done to confirm this. Four main building materials - coral, anhydrite, gypsum (gypsite), and limestone - were used in construction at Berenike. The coral probably came from the reef rubble of the coral terrace. In construction, the coral was held together by a locally derived mortar consisting of gypsiferous, bioclast sediment. The anhydrite, gypsum, and limestone were most likely quarried from formations on Ras Banas. All rocks evident on the site could be found locally except for vesicular basalt and carbonate cobbles, which were possibly brought to Berenike as ship ballast. Other exotic materials included a piece of peridot from Zabargad Island, emeralds, a flake of obsidian, and a piece of cut, polished marble from Turkey. Many anhydrite and gypsum ashlars were used in critical parts of coral walls in buildings of late periods throughout the site, suggesting that they came from a single building, perhaps the Serapis temple, which had been partially or wholly dismantled in antiquity. Some of the finds this year merit specific description, and certainly one of these is the bronze statue from Trench BE95-6 (see Figure 5). At higher levels of the trench, many bronze fragments, including an arm with a snake entwined around it, were discovered. Further excavation revealed the statue intact below the knees and standing on a gypsum pedestal. Hopes for an inscription on the pedestal were not fulfilled, but the presence of the snake indicates that the statue may be of Hygieia, a healing goddess who had a popular following. Originally regarded as the daughter of Asclepius, the Greek god of healing, she eventually was considered as his divine companion and female counterpart. That the cult of a healing goddess was present at Berenike is not surprising. I suspect that the albeit harsh environment that the residents of Berenike lived in and the dangerous journeys of the merchants and sailors made many people associated with Berenike very aware and appreciative of health matters. Also, the Romans might have tried to make the local nomadic population more health-conscious by bringing their medical philosophies and their healing deities. It would be interesting to know how the natives interpreted a goddess who was associated with snakes. Another interesting item from BE95-6 was what appears to be a statue head carved out of gypsum (see Figure 6). It looks like an animal, but what it is exactly is not known. Some speculated that it was a lion, but there is no surety to this hypothesis. The shape in which the form of the animal has been molded suggests to me that it was a kind of ornamental piece to attach to a wall or column, or that it was perhaps an armrest for a special bench or chair. Also located near the above two items in BE95-6 were two altar basins, one large and one small, and an incense burner that is shaped like a temple pool with two miniature staircases leading into the pool. I saw altar basins that were almost identical to the ones at Berenike when I was walking around some Roman ruins near the temple of Luxor. A small figurine of Harpocrates, the child Horus, was found in BE95-5. It may have been an amulet-it is very small and depicts only the head. The piece can be identified by the shaved head and sidelock of youth and the finger pointed to the mouth, a common representation of Harpocrates. He was supposedly stunted from the waist down because of his premature birth, and he is commonly show as seated and sucking his thumb or as a baby being suckled by Isis. As a part of the Alexandrian triad of Serapis, Isis, and Harpocrates, he became the form of Horus most worshipped in late times, particularly with the rise of Isis as great-mother goddess. The god of the poor and humble, "Horus-the-child is specifically the potential that is still weak and defenceless as a child, the power that needs to be nurtured" (Quirke 17). It seems hardly surprising to find evidence of Harpocrates in Berenike, where the primary temple is that of Serapis. In addition to the intact 4th/5th century amphoras from BE95-5, special pottery finds included various ostraca, frog lamps, and amphora lids with designs on them. Of particular interest were a couple of pottery sherds on which a ship was drawn that I believe supports Dr. Sidebotham's opinion on the kind of masts that were used on ships in the Red Sea. A new kind of amphora was discovered, the pieces of which I managed to put together and obtain the shape from top to bottom of the otherwise fragmented amphora. The excavations will most probably continue on as long as the site produces useful information-and looking at how little of the town has been touched, it will probably be many years before it dries up. However, I am quite amazed at how much information a few well-placed trenches can yield. This report is just the tip of the iceberg, a way of getting acquainted with Berenike and what is happening there. It will be interesting to see how the specialists imbue the finds with meaning so that we can better understand the port and its inhabitants and visitors. Members of the Berenike team for the 1995 season who provided information for this report. I would like to thank several people for the help they gave me before, during, and after my visit to Berenike. Dr. David Hoch started it off by make sure that I contacted Dr. Harrell about his trips to Egypt. Dr. James Van Fleet and the others on the committee which approved my application for a travel grant made the trip financially feasible for me. I would very much like to thank Dr. Jim Harrell for inviting me to accompany him on an extraordinary adventure and for his help as a teacher, advisor, and friend. Lastly, I am forever grateful for all of the wonderful friends I made while at the site and while traveling around Egypt. I will not forget this experience, and I hope that more students will take advantage of opportunities such as this.